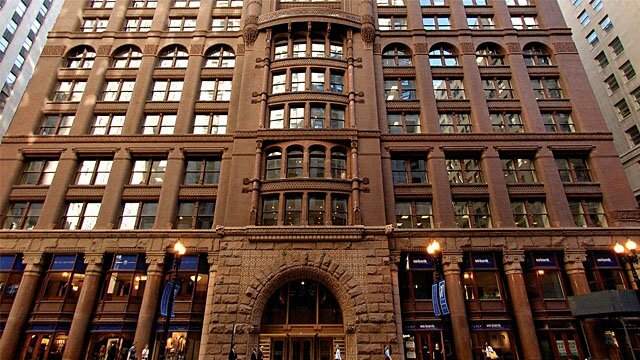 One of the Loop buildings most beloved by architecture fans, the Rookery is known for its dramatic, sky-lit interior light court; its spiraling cast iron staircase; and its bold façade of red granite, brick and terra-cotta ornament. At 16 stories, it is one of the oldest high-rise buildings in Chicago. The building was named for the birds that roosted on a previous structure that stood on the site. To honor that heritage, architects Daniel Burnham and John Wellborn Root placed sculptures of rooks (a kind of crow) in the building’s exterior ornament. In 1907, Frank Lloyd Wright redesigned the building’s light court. By 1989, the interior public spaces were badly in need of restoration after decades of deterioration and alterations, and Chicago restoration architect Gunny Harboe directed their return to glory.